This is a sponsored conversation written by me on behalf of NatureRaised Farms. The opinions and text are all mine. The holidays are the season of decadence and I’m no stranger to things that are a little over the top. The thing is, I want them to be easy too. 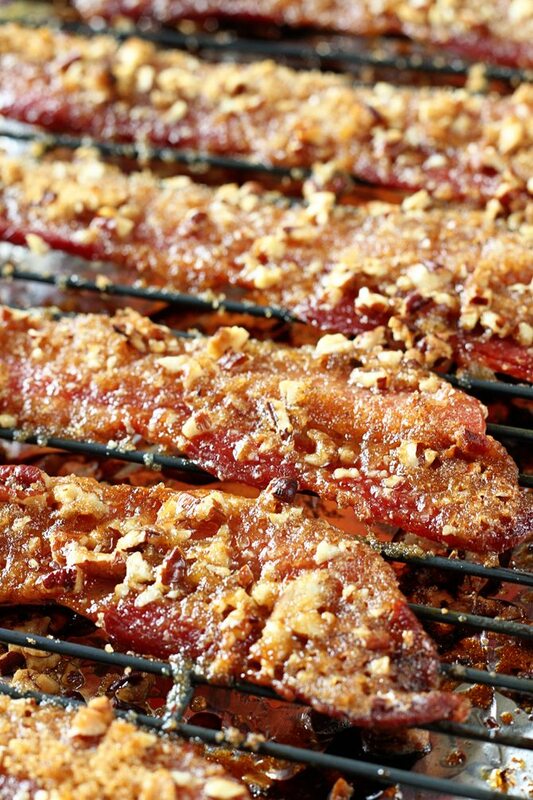 Enter my Praline Bacon. 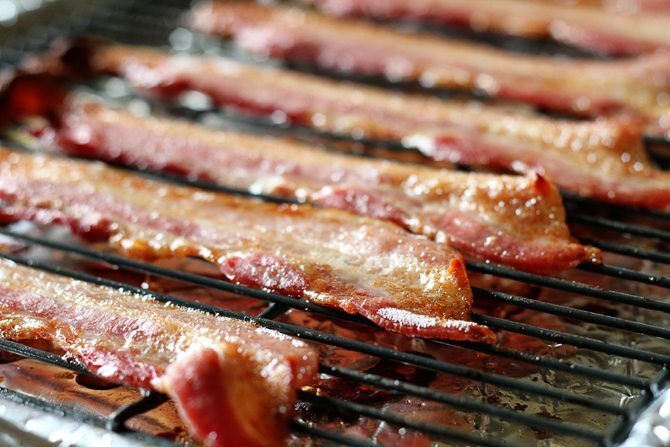 It is literally the stuff dreams are made of… if your dreams are made of bacony, sugary, caramely goodness. And let’s be honest.. whose aren’t??? It’s the perfect treat to serve yours guests this holiday season whether in bite size pieces at a party or for breakfast or brunch. And because it’s so easy, you’ll have more time to spend with family and friends! 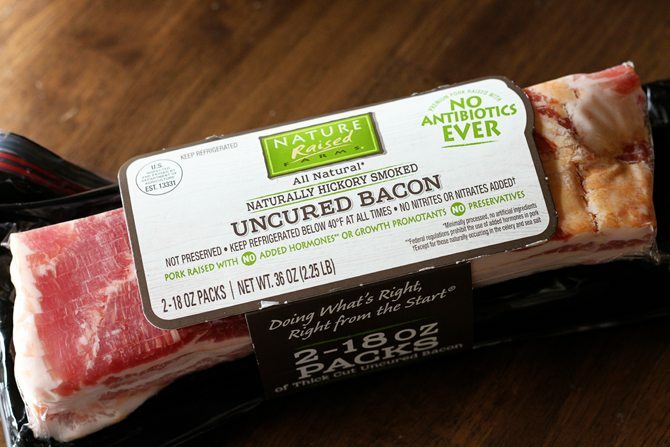 I start mine with NatureRaised Farms Hickory Smoked Uncured Bacon. It’s thick-cut, so it’s perfect for this recipe. And it’s available in a two pack at Sam’s Club so it’s a great option to have some extra on hand for the holidays. Find your local Sam’s Club. To begin, preheat the oven to 450°F and line a jellyroll pan with foil. A jellyroll pan is simply a baking sheet with edges. You’re gonna want to use a pan with edges to keep the bacon grease from pouring all into your oven. Lining it with foil makes cleanup a breeze. Find a cooking rack that is oven safe and place it inside the pan. I happen to have a set that came with the pan and rack that works perfectly for this. In small bowl, combine the brown sugar and finely chopped pecans. Cook the bacon for about 20 minutes or until it is just starting to crisp around the edges. 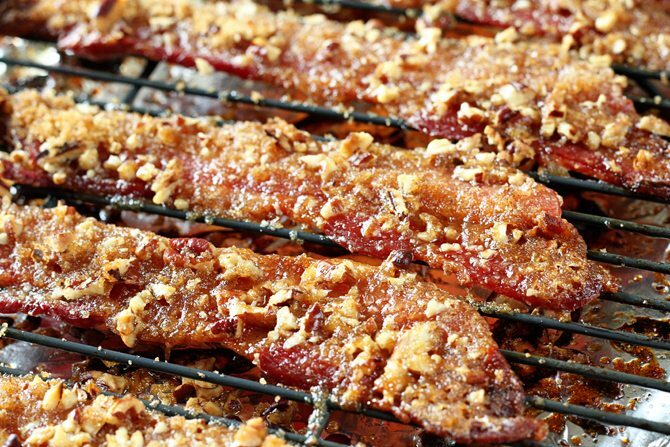 Generously sprinkle the brown sugar mixture on each slice of bacon. Return to the oven for about 10 minutes or until the bacon is crisp and the sugar has melted. Look at that bacony, sugary goodness right there. Y’all just have to try this. Seriously. Preheat the oven to 450°F and line a jellyroll pan with foil. 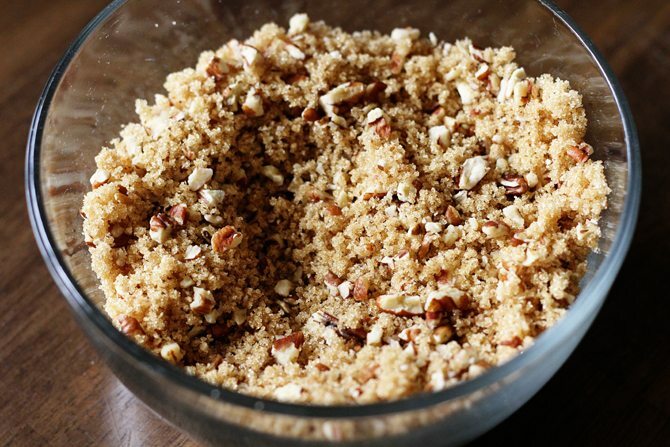 In a small bowl, combine the brown sugar and finely chopped pecans. 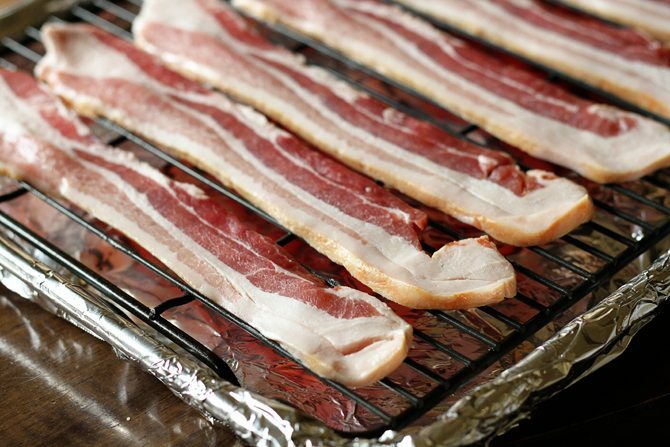 Place an oven-safe rack that into the pan to keep the bacon out of the drippings. Spread the bacon pieces on the rack and cook for about 20 minutes or just starting to crisp around the edges. 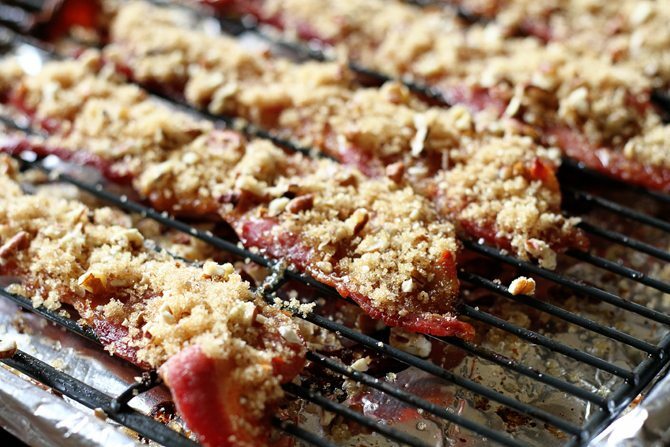 Remove from the oven and generously sprinkle each piece of bacon with the brown sugar mixture. Return the bacon to the oven and cook until crisp and the sugar has melted. This is a sponsored conversation written by me on behalf of NatureRaised Farm. The opinions and text are all mine. Looks like something I would love to eat. My favorite Christmas cookies are Fruitcake Lizzie’s! Anything with cream cheese in it, LOL! This sounds terrible…for my waistline! ? Thanks for sharing this recipe. I’m definitely going to have to try it. Yum! My favorite Christmas food is peppermint bark popcorn. I make it every year and it’s always a hit! We’ll definitely be making this for our New Year’s Eve buffet. My favorite holiday treat are the special cookies that my sister-in-law makes. The family call them Fingers. We love to decorate sugar cookies and eat them with hot chocolate and marshmallows. This bacon is calling my name. I’ll just have to try it. My favorite treat for Christmas is my chocolate gravy with biscuits on Christmas morning. I just finished making the peanut clusters, tomorrow peanut brittle! The best! Thanks for the recipe!! Cinnamon rolls on christmas morning. We love them. My mom would make me Sot Suppe, a Norwegian sweet soup. I loved that. Homemade eggnog on Christmas Eve! My sister’s homemade shortbread cookies! YUMM!!! Snowball Cookies with finely chopped pecans, rolled in powdered sugar with a cup of coffee is my all-time favorite Christmas snack!! Thumbprint cookies. In fact, all the cookies. But I only have thumbprint at Christmas. Hot cocoa, cookies, I love it all! Martha Washington Candy was made every year when the kids were home. We would make big batches and then divide into several bowls. Most was the traditional with coconut and chopped pecans and dipped in chocolate, (It freezes so well.) For the other bowls we left out the coconut and pecans and one had mint flavoring; flattened with a glass and dipped in chocolate. One had marschino cherries drained very well; wrapped the dough around and dipped in chocolate. One had orange flavoring and zest and dipped in chocolate. Another had lemon flavor and zest and dipped in white chocolate with lemon flavoring. Rum flavoring for the adults and dipped in chocolate. And this year I have already made two fruitcake batches. One doubled and today’s was tripled using a Fresh Apple cake recipe and fruits and nuts of YUR choice. Mine – fruitcake mix candied fruit, candied cherries, regular and golden raisins both, dried apricots snipped up with scissors, dried pineapple, pecans, walnuts and the SECRET to a moist, not dry fruitcake is to add 1 banana mashed up with a fork to your batter. Merry Christmas to Everyone! Yum! I love Martha Washington’s! I make a batch almost every year. I might have to try some of your variations this year because so many people are not coconut fans! Looks so yummy!! Definately a must try! Egg nog anything. Ice cream, drink, latte, yum!! Chocolate fudge made with Hershey’s cocoa. We only make it at Christmas. My favorite has always been a good, old-fashioned, home made fruitcake!! No store bought, ever! Thanks for your recipes. These look awesome! Do I have to serve them right away? I would love to try these for my open house, but would they still taste good if room temp??? It’s best served slightly warm but will be fine once it’s cooled as well. It’s just not something you can make the day before. My Grandmothers chocolate fudge is a timeless tradition! My favorite Christmas treat has to be Red Velvet cake balls and milk punch. Makes me think of my grandmothers. 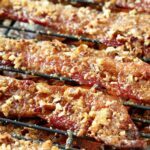 Candied bacon! 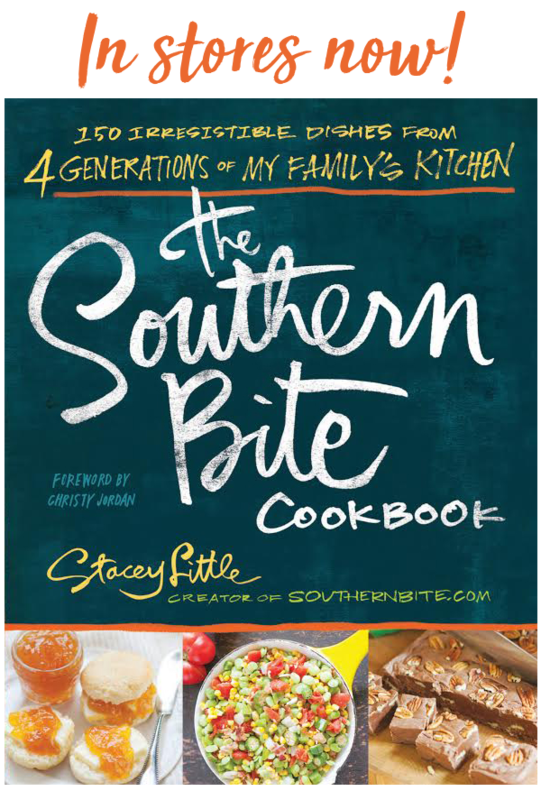 You know I will have to make this for my family. Our treat is Eggnog Truffles and hot cocoa with a peppermint stick to stir. Only once a year at Christmas, so it is special and creates meaningful memories. Oatmeal Fudge is my favorite. I love no bake chocolate cookies. I also love bacon; I do a daily email for work and I am always emailing recipes regarding bacon. A no bake cookie we call reindeer poop. I know not very appetizing, but my girls named it when they were young and it stuck. It has white chocolate, rice crispies, mini marshmallows. Not the whole recipe but you get the idea. They are addictive. Cranberry salad…YUM! I gotta tell you; I love, Love, LOVE your blog! Marsha over at “The Better Baker” posted your Mac & Cheese recipe one day and I’ve been BITTEN (pun intended) ever since! Being a good ol’ southern gal myself I can relate. 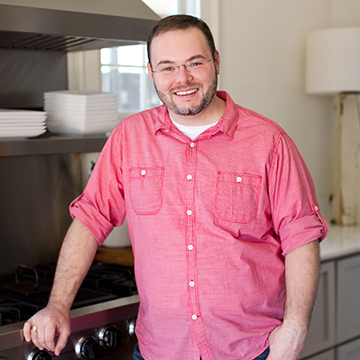 Keep the posts and W O N D E R F U L recipes coming, I adore reading your entries! Happy Holidays to you and your family! Thanks, Deb! You’re so sweet to say that! Merry Christmas! Favorite holiday snack: COOKIES! Any kind, traditional and new, particularly Italian biscotti and sugar cookies. As long as they are homemade, nothing premixed or prebaked, thank you very much!! Yummy year round, Makes any day a grrrrrrreat holiday! I love Sams club and I love bacon. I want to try this. If I win I’m gonna buy all bacon and make these for Christmas. My favorite thing to make are chewy noels. A soft bar covered with powder sugar. My favorite Christmas food is hard to say… I love so much of the special seasonal food. Cookies, hot chocolate, candy, spiced tea, cakes, pies, spiced nuts and all. Savory or sweet, I love it all. I think I love the memories of Christmas past most of all. I love making crunchy little meringues! My favorite is mint chocolate chip meringue cookies! I know it might sound silly as an adult being able to make it myself, but it’s just not the same as Mom’s. I’m so grateful after all these years that she is able to still make it. This looks absolutely delicious!! My boys will go nuts over this!! There favorite holiday treat would definitely be my homemade fudge!! My favorite is icebox cookies!! Your Red Velvet Cheesecake Brownies! !